Last updated on: as of 4 March 2019[update]. 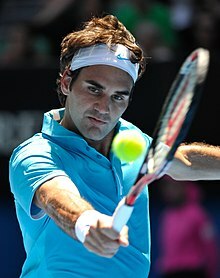 Federer has won a men's record eight Wimbledon titles, six Australian Open titles, a record five consecutive US Open titles, and one French Open title. He is one of eight men to have achieved a career Grand Slam. Federer has reached a record 30 men's singles Grand Slam finals, including 10 in a row from the 2005 Wimbledon Championships to the 2007 US Open. Federer has also won a record six ATP Finals, 27 ATP World Tour Masters 1000 titles, and a record 22 ATP World Tour 500 titles. Federer is also the only player after Jimmy Connors to have won 100 career singles titles or more in the Open Era. In 2003, he established the Roger Federer Foundation to help disadvantaged children and to promote their access to education and sports. Since May 2004, citing his close ties with South Africa, including that this was where his mother had been raised, he began supporting the South Africa-Swiss charity IMBEWU, which helps children better connect to sports as well as social and health awareness. Later, in 2005, Federer visited South Africa to meet the children that had benefited from his support. Also in 2005, he auctioned his racquet from his US Open championship to aid victims of Hurricane Katrina. At the 2005 Pacific Life Open in Indian Wells, Federer arranged an exhibition involving several top players from the ATP and WTA tour called Rally for Relief. The proceeds went to the victims of the tsunami caused by the 2004 Indian Ocean earthquake. In December 2006, he visited Tamil Nadu, one of the areas in India most affected by the tsunami. He was appointed a Goodwill Ambassador by UNICEF in April 2006 and has appeared in UNICEF public messages to raise public awareness of AIDS. In response to the 2010 Haiti earthquake, Federer arranged a collaboration with fellow top tennis players for a special charity event during the 2010 Australian Open called 'Hit for Haiti', in which proceeds went to Haiti earthquake victims. He participated in a follow-up charity exhibition during the 2010 Indian Wells Masters, which raised $1 million. The Nadal vs. Federer "Match for Africa" in 2010 in Zurich and Madrid raised more than $4 million for the Roger Federer Foundation and Fundación Rafa Nadal. In January 2011, Federer took part in an exhibition, Rally for Relief, to raise money for the victims of the Queensland floods. In 2014, the "Match for Africa 2" between Federer and Stan Wawrinka, again in Zurich, raised £850,000 for education projects in Southern Africa. On 24 November 2017, Federer received an honorary doctorate awarded to him by his home university, the University of Basel. He received the title in recognition for his role in increasing the international reputation of Basel and Switzerland, and also his engagement for children in Africa through his charitable foundation. Federer's main accomplishments as a junior player came at Wimbledon in 1998, where he won both the boys' singles final over Irakli Labadze, and in doubles teamed with Olivier Rochus, defeating the team of Michaël Llodra and Andy Ram. In addition, Federer lost the US Open Junior final in 1998 to David Nalbandian. He won four ITF junior singles tournaments in his career, including the prestigious Orange Bowl, where he defeated Guillermo Coria in the final. He ended 1998 with the No. 1 junior world ranking, was awarded ITF junior World Champion, and entered his first tournament as a professional during 1998 in Gstaad, where he lost to Lucas Arnold Ker in the first round. 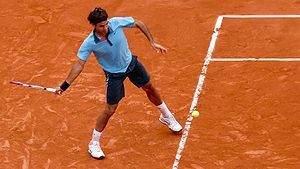 Federer entered the top 100 ranking for the first time on 20 September 1999 and started at the 1999 Marseille Open defeating the reigning champion of the 1998 French Open, Spaniard Carlos Moyá. His first final came at the Marseille Open in 2000, where he lost to fellow Swiss Marc Rosset. Federer won the 2001 Hopman Cup representing Switzerland, along with world No. 1 Martina Hingis. The duo defeated the American pair of Monica Seles and Jan-Michael Gambill in the finals. Federer later said that his experience with Hingis "definitely helped me to become the player I am today." Federer's first singles win was at the 2001 Milan Indoor tournament, where he defeated Julien Boutter in the final. Although he won his first title already in 1999 on the Challenger tour, winning the doubles event in Segovia, Spain with Dutchman Sander Groen, the final was played on Federer's 18th birthday. In 2001, Federer made his first Grand Slam quarterfinal at the French Open, losing to former world No. 2 and eventual finalist Alex Corretja. His run to the French quarterfinals launched him into the top 15 for the first time in his career. At the Dubai Tennis Championships, Federer won his 100th Career Singles Title, beating Tsitsipas in straight sets in the final. It was his eighth title in Dubai and he became only the second man after Jimmy Connors to reach the three figure mark in the Open Era. At the 2004 Summer Olympics in Athens, Federer was the clear favorite after claiming the world No. 1 ranking earlier in the year and capturing the Australian Open and Wimbledon titles. However, he lost in the second round to 18-year-old Tomáš Berdych. In doubles, he and compatriot Yves Allegro lost in the second round. 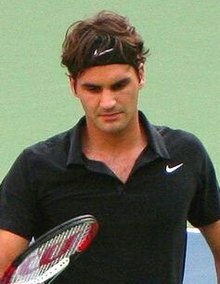 At the 2008 Summer Olympics in Beijing, Federer was again the top seed and favorite, but lost in the quarterfinals to James Blake. However, he found more success on the doubles court, capturing the gold medal in men's doubles with compatriot Stan Wawrinka, defeating Simon Aspelin and Thomas Johansson of Sweden. 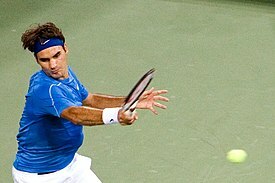 At both the Athens and Beijing Olympic Games, Federer was the flagbearer for Switzerland in the opening ceremony. Roger Federer is the most successful individual in Hopman Cup (3 titles) to date. Federer and his fellow Swiss player Stan Wawrinka have played each other 24 times, with Federer leading 21–3. Federer leads 6–1 in Grand Slam tournaments, 16–0 on hard courts, 1–0 on grass courts and 4–3 on clay courts. The pair are 1–1 in finals. Their first meeting in a final came at 2014 Monte-Carlo Rolex Masters where Wawrinka defeated Federer in three sets to win his first Masters 1000 title before Federer avenged his loss at the 2017 BNP Paribas Open by beating him in the final. While the rivalry is one-sided in Federer's favour, the two have contested some close matches. Wawrinka defeated Federer in straight sets during the 2015 French Open quarterfinals en route to winning his first French Open title, although Federer then won a straight-sets victory in the 2015 US Open semifinals. Other close matches include the 2012 Shanghai Masters and the 2013 Indian Wells Masters, both of which Federer won in three sets, the 2014 Wimbledon quarterfinal, which Federer won in four sets, the 2014 ATP World Tour Final semifinal, which Federer won in three sets after saving four match points, and the 2017 Australian Open semifinal, which Federer won in five sets. Despite their on-court rivalry, they are friends off court, and they have played doubles together on numerous occasions, most notably when they won the doubles Olympic Gold at the 2008 Beijing Olympics and when winning the 2014 Davis Cup. Later in his career, Federer added the drop shot to his arsenal and can perform a well-disguised one off both wings. He sometimes uses a between-the-legs shot, which is colloquially referred to as a "tweener" or "hotdog". His most notable use of the tweener was in the semifinals of the 2009 US Open against Novak Djokovic, bringing him triple match point. Federer is one of the top players who employ successfully the "squash shot", when he gets pushed deep and wide on his forehand wing. Since Stefan Edberg joined his coaching team at the start of the 2014 season, Federer has played a more offensive game, attacking the net more often, and improved his volley shots. In the lead-up to the 2015 US Open, Federer successfully added a new unique shot to his arsenal called SABR (Sneak Attack by Roger), in which he charges forward to receive the second serve and hits a return on the service line. The SABR is a unique shot that Federer owns, in the way that he manages to add enough power and placement into the shot, which makes it very difficult, or close to impossible for the opponent to reach it. With the switch to a bigger 97 inch racket from 90 inches, Federer has gained easy power while relinquishing some control on his shots. The bigger racket has enabled easier serving and better defense on both wings with fewer shanks. However this has diminished easy control and power on his forehand, slice backhand and dropshot. 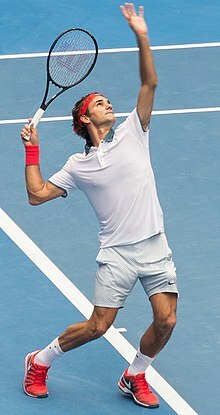 Since his comeback in 2017, Federer is noted for his improved backhand both down the line and cross court which was cited as the reason for his win against Nadal in the 2017 Australian Open Final and Indian Wells 4th round. ^ a b "Player profile – Roger Federer". ATP World Tour. Retrieved 8 December 2014.